If you’re looking to create an online store, you’ll want to find a solution that is uniquely tailored for e-commerce. While there are plenty of platforms you can use, finding one that offers all the features you need can be tricky. Magento is one of the most powerful and popular options and is a solid place to start. As a free open-source platform built specifically to support e-commerce sites, it’s a flexible and highly scalable solution. It also doesn’t rely on external software to function, making it ideal for just about any type of e-commerce business. In this article, we’ll introduce you to Magento and discuss why you might want to use it for your e-commerce venture. We’ll also show you the basics of getting started with the software to create your own storefront. Let’s get to work! When it comes to Content Management Systems, Magento stands out from the pack. Unlike platforms such as Joomla! and WordPress, Magento is built specifically for creating online stores. However, users familiar with using any CMS will still feel at home with the platform, as it offers a similar user-friendly but flexible interface to help you manage your sites. Magento began as a free open-source CMS in 2008 but has since evolved into two separate entities. One of these is the standard version of the platform, which remains free and community-driven. Fittingly, it’s called Magento Open Source. Conversely, the Magento Commerce edition is a paid version with expanded functionality, which is primarily intended for enterprise businesses. It offers increased scalability and includes access to expert support. While this makes it a smart choice for larger businesses, most smaller stores will likely do just fine with the Open Source edition. Regardless of which version you pick, if you decide to use Magento, your e-commerce site will be in excellent company. This CMS has been used to create online stores for Helly Hansen, Regis Corporation, Marie Claire, and Paul Smith, just to name a few. As we’ve mentioned, the main advantage of Magento over many of its competitors is its sole focus on e-commerce. All of its functionality and mechanics have been designed with this purpose in mind. With most other popular platforms, such as WordPress, you’ll need specialized tools to add all the necessary functionality to your site. In practice, Magento works much like any other CMS, in that it enables multiple users to manage your store using a centralized interface. You can add products, create categories, configure your store’s functionality and appearance, and alter basically every aspect of your e-commerce site. Built-in caching for increased speed. Magento includes caching, which helps to speed up your store. Scalability. Magento was built from the start to handle large businesses, so even if you start small, you can easily expand your site to match your store’s growing needs. Multi-site support. You can use this one product to run several stores with different settings, and even keep them connected to one another. Excellent performance. This platform has been constructed to cope with sites of all sizes, and offers solid speed and performance across the board. While Magento is not quite as beginner-friendly as its main rival WooCommerce, it still provides an intuitive interface for managing your site. That means it’s at least worth considering when creating a new store. As we mentioned earlier, Magento is a complete e-commerce solution, which means you won’t need any other software to run it. As such, it’s an excellent choice if you don’t want to use WordPress just to get the benefits of WooCommerce or you’d prefer not to rely on a third-party site to host your store. Magento also lends itself particularly well to large businesses. This is due to its top-notch security, speed, and scalability. The multi-site support can also be a useful tool for many businesses. For example, you could create a different store for each geographic region you’re targeting or for different sections of your business. The independence and flexibility that Magento offers, therefore, makes it a reliable option for many store owners. However, it could be a little too complex for a complete novice and might be overkill for smaller stores. Also, since it’s so e-commerce specific, a platform like WordPress might be a better option if you want to run a blog or business site alongside your store. If you do decide that Magento is right for you, all that’s left is to get your store up and running. In this section, we’ll be looking at how you can get started with Magento, including how to add products and extend your site’s functionality. The first step is to install Magento on your site. 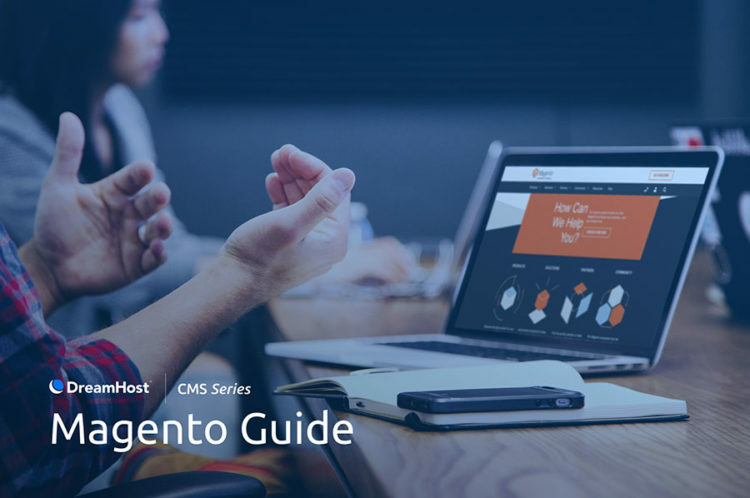 Before you begin, you’ll need to be sure that your server can support Magento’s minimum requirements and that your hosting plan has all the available resources that the CMS needs. We recommend that you use either a Virtual Private Server (VPS) or dedicated hosting plan, as large stores may otherwise suffer from downtime and slowdowns. After that, you’ll need to manually install the software. This can get a little complex. In addition, the actual process of installing Magento on your site will likely differ depending on your chosen host. However, the general steps will remain the same for just about everyone. Make sure your PHP memory limit is at least 756MB. Create a MySQL database for your site, if you don’t have one already. Bear in mind that some services will let you create a new database when you install the software. Download the version of Magento that you want to use. You can get the free Open Source edition right here. Use SFTP to upload the files to your site’s server. Make sure to save them in your site’s root directory. At this point, Magento is almost ready for you to use. However, in some cases, you might encounter a 500 error message when you try to access your site using your browser. This is likely due to an issue with your .htaccess file. To resolve this problem if it occurs, you’ll need to edit the .htaccess file, which you can do by using SFTP or SSH. You’ll need to make changes to any line that includes IfVersion. This is because those lines are calling a module that your server does not have, so you will need to delete them. All you’ll need to do is to simply delete all lines with either IfVersion or 2.4 in them. If you did this with the example above, you’d be left with the following. Once you’ve done that, you can safely save your file and upload it back to the server. You should now be able to access your site to complete the installation process. 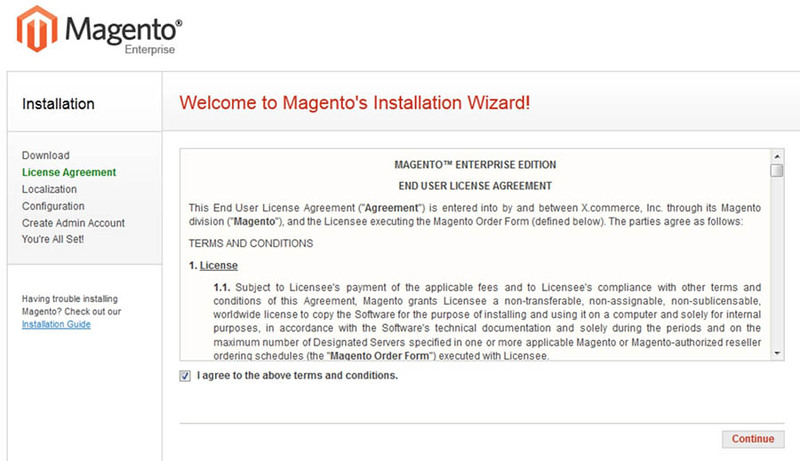 When you now try to access your site, you’ll most likely be greeted with the Magento installation wizard. Readiness check: This runs a check on your site to make sure the software can be installed safely. Add a database: Here, you can create a database for your site. Web configuration: This is where you’ll configure your store’s basic information, including its name and the URL for its admin interface. Customize your store: On this screen, you can specify your store’s details, such as its timezone and default currency. 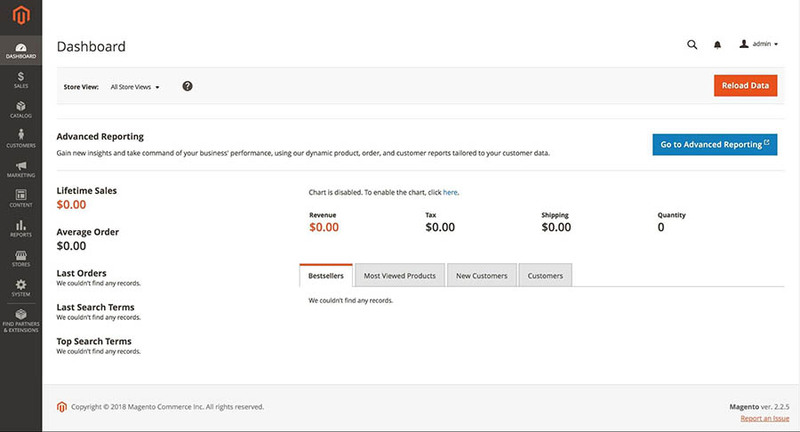 Create admin account: This lets you set up your account, which you’ll use to manage the store. Install: Finally, the last step installs Magento on your site. Once that’s done, your Magento site will be ready. You can now access your new admin area. This is the interface you’ll use to manage all aspects of your site. It’s here that you can configure your store, add products, manage orders, install new modules, change the site’s appearance, and much more. To access the admin area, you’ll need to use the admin credentials you specified during the installation process. 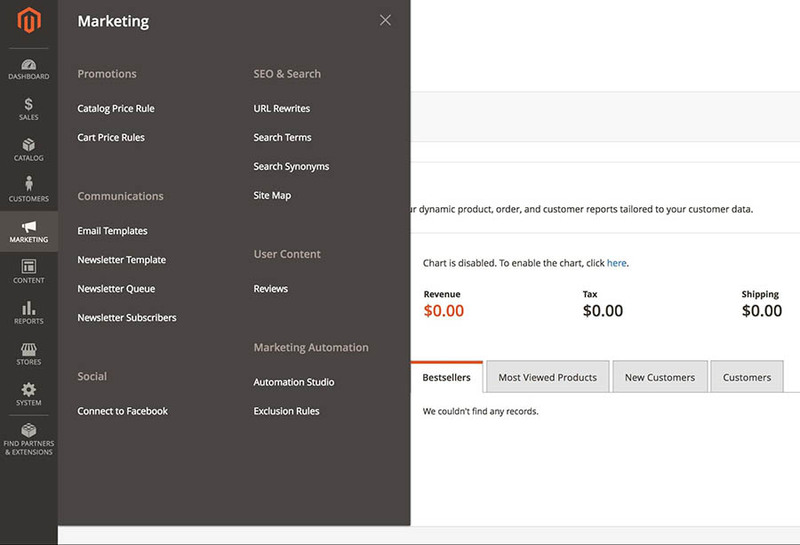 The first page you’ll usually see is the Dashboard, which contains an overview of your store’s recent activity. The rest of the interface is split into multiple tabs, which you can see in the menu on the left. Clicking on one of these options will expand it and show you all of the sub-sections. As you can see, there are plenty of options and features here, and we don’t have the space to cover all of it right now. If you want more information about everything that’s available, we recommend checking out the comprehensive official documentation. It’s finally time to add some content to your site, so let’s start with the basics. After all, what’s a store without products? To add your first one, you’ll need to navigate to Catalog > Products. There’s nothing here right now, so let’s create something! There are plenty of different product types you can use. For this example, we’ll stick with a simple product, which refers to any physical item. To get started, click on the Add Product button. This opens a form where you can configure your new product. While the sheer amount of options here can seem daunting, most of the settings are self-explanatory, and many of them are optional or not required for a majority of products. For instance, the only required fields in the first section are the product’s name, its Stock Keeping Unit (SKU), and its price. After that, you can specify plenty of additional information, such as the item’s dimensions, stock levels, and so on. If you scroll down the page, you’ll see even more sections with additional options. While none of these are required, it’s usually best to include as much information as possible. For instance, you may want to add product images and videos, and you can also specify Search Engine Optimization (SEO) options for the product to improve its visibility. On this screen, you can also specify an attribute set. This is essentially a template that you can use for similar products, which lets you enter all the relevant information specific to that type of item. 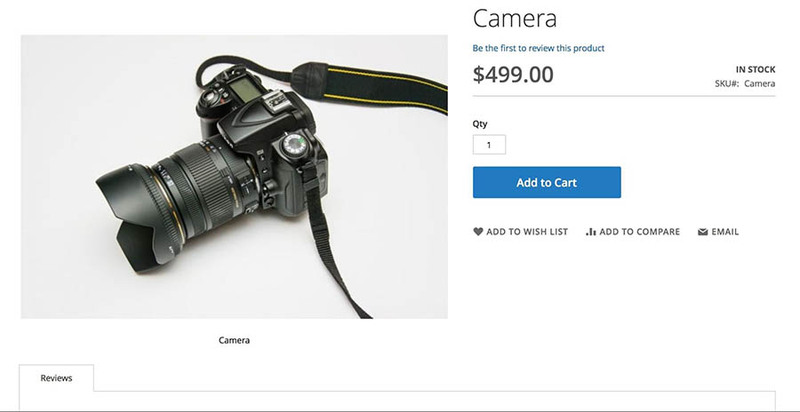 For example, if you’re selling a camera, the product page may need to include details about megapixels, shutter speed, lenses, and so on. Once you’ve specified all the information you want, you can select Save to create the product. 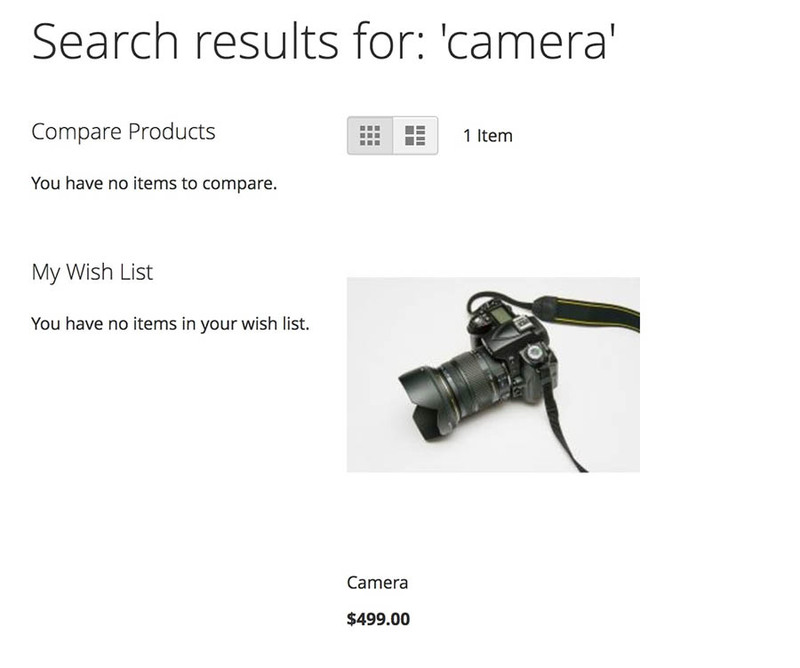 If you go to your store and search for the item, you should see it pop up in the results. You can also click on this result to open the product page, where you can see all the information you’ve entered. In addition to creating products individually, you can also import multiple products at once. This can be especially useful if you’re moving your store from another platform (so you don’t have to add each product one by one). While a default Magento installation is plenty powerful, you’ll most likely want to expand on its standard functionality. You can do this using Magento extensions, which are blocks of code that you can easily install on your site. They’ll add new functionality or make changes to the site’s default features. To add extensions, you’ll need to use the Extension Manager and set up an account at the Magento Marketplace. Marketplace accounts are free, and you can register for one here. Once you have an account, you can access the Extension Manager by going to System > Web Setup Wizard. Here you can select Extension Manager, at which point you’ll be asked to provide your public and private keys. You can find these in your marketplace profile information. After you’ve done that, the Extension Manager will open up. When you purchase extensions from the marketplace, they will appear under the Ready to Install section. Just click on Install to add an extension to your site. This will start an installation wizard, not dissimilar from the one you used to set up Magento in the first place. Complete each step, until the extension is ready to be used. You can also use this process to install new themes on your site. Themes let you change the appearance and layout of your store. Once you’ve installed one, you can set your site’s default theme by going to Content > Configuration. Here, find the store you want to apply the theme to and click Edit. This takes you to a page where you can choose whatever theme you’d like to use. When you’ve done that, you’ve covered all the basics of Magento! At this point, we recommend that you take some time to experiment with what the platform has to offer and refer to the official documentation for more information as needed. Magento stands out from your typical CMS options by completely focusing on e-commerce. 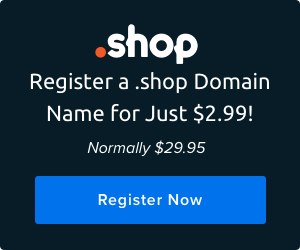 This makes it a powerful alternative if you want to start an online store, as it includes everything you’ll need to create a powerful, fast, and secure site right out of the box. Do you have any questions about how to get started with Magento? Join the DreamHost Community and let’s start the conversation!